Are you in a psychedelic mood? Well, if not, let me get you in one. The Deep is a perfect example of an obscure classic rock band, one that has been often overlooked by fans of the protopunk and psychedelic genres of music. The band achieved virtually no success (unlike their Cameo-Parkway label mates Question Mark and the Mysterians who scored big with their 1966 hit “96 Tears”) and are rarely mentioned in today’s discussions about inspirational 60s bands. The Deep is categorically underrated and this is unfair. 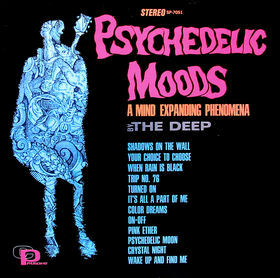 They only released one album (under the name The Deep) and it is quite possible that The Deep were more of a studio band; they did not tour to support their only release Psychedelic Moods. But that one album should have provided the band with a little more popularity. The Deep was formed in Philadelphia during the mid-60s. Greenwich Village folk musician Rusty Evans (Marcus Uzilevsky) took on the role of lead guitarist and singer-songwriter. Past him, the identity of the rest of the band members is shrouded in a bit of mystery. We have names, but nothing is confirmed. Actually, folk musician David Bromberg is thought to have played on the debut release, but the tracks which he played on are unknown. Psychedelic Moods does have one claim to fame. It was released in October of 1966. *Disclaimer* – this next comment is subject to an ongoing debate. The Blues Magoos’ Psychedelic Lollipop was released on November 1 of 1966 and The Psychedelic Sounds of the 13th Floor Elevators by the 13th Floor Elevators was released later in November. The Deep is thought to be the first band to employ the word psychedelic on an album name. Neat, right? It may or may not be true. Who knows? But it seems plausible. That is not why I think they should have received more attention. Why should they have? Their distinct blend of protopunk and psychedelic music was fuzzy, warm, infectious, and ahead of its time. That’s why. “Color Dreams” is a great example of an experimental band. You can tell that they are mixing a concoction of psychedelic and garage rock/protopunk. It is tasty. The song’s base is a normal riff and vocal. Layered on this foundation, like moussakka, is a soft portion of strange noises, light piano, and muddled voices. In 1966, this psychedelic experimentation was fresh and exciting. The Deep was one of the first bands to capture this sound. “Trip #76” is a repetitive piece that plays with a basic, somewhat shrill guitar riff. It reminds me a lot of music that the psychedelic band Love produced around the same time. Drawn-out poetry, repetitive riffs; garage psychedelia at its finest and earliest!